With just 8 days until Knesset election, poll shows Likud with narrow lead, while right-wing bloc maintains 8-mandate lead over Left. Prime Minister Binyamin Netanyahu is well-positioned to win a fifth term as premier, a new poll shows, with the Likud party maintaining a narrow lead over its nearest competitor, the Blue and White party of former IDF chief of staff Benny Gantz. According to the poll, conducted by Panels Politics for Channel 12, if new elections were held today, the Likud would win 31 seats – one more than the party currently has – compared to 30 mandates for the Blue and White party, an amalgamation of Yair Lapid’s Yesh Atid faction and the new Israel Resilience faction. The results for the two parties are identical to the results in the previous Panels Politics poll, released last Wednesday. 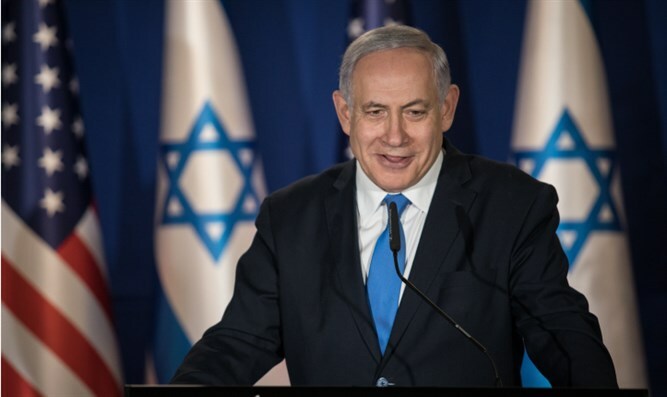 When asked which candidate they believe is most suited to serve as prime minister, respondents strongly backed the incumbent, Netanyahu, in the poll, with 53% calling him the most qualified, compared to just 30% who said Gantz was most qualified. Monday’s poll also showed the right-wing – religious bloc maintaining a wide lead over the left-wing – Arab bloc, though the right’s margin did decrease over the past five days, falling from a 68 to 52 margin in favor of the Right, to 66-54. The Labor party, which won 19 seats in 2015, remained stable at nine, while the Hadash-Ta’al joint Arab list ticked up from Wednesday to nine seats from eight. The second Arab ticket, a joint list of Balad and the United Arab List, failed to cross the threshold in Monday’s poll, as it did in last Wednesday’s survey. In 2015, all four Arab factions – Hadash, Ta’al, Balad, and the UAL – ran on the united Joint List, winning 13 seats. The far-left Meretz faction, which won five seats in 2015, ticked up in Monday’s poll from five seats to six, while the center-left Gesher faction again failed to cross the threshold. The center-right Kulanu party of Finance Minister Moshe Kahlon remained stable at four seats, a major decline compared to the 10 seats the party won in 2015. Yisrael Beytenu also remained stable in Monday’s poll with four seats, the same number it received last Wednesday. Former Likud MK Moshe Feiglin’s libertarian-leaning Zehut faction retained the five seats it received in last week’s poll, while the New Right of Naftali Bennett remained stable at six seats. The Union of Right-Wing Parties, a joint list of the Jewish Home, National Union, and Otzma Yehudit, fell from seven mandates in last week’s poll to just five.